One S.P. French Mc and DJ in Edinburgh. Scroll down menu here » Blog Archive » One S.P ALBUM LUNCH PARTY ! mc1sp.com | One S.P ALBUM LUNCH PARTY ! AND THE OPPORTUNITY TO EXPERIENCE A FULL SET OF One S.P (froggylicious records), YOUR LOCAL FRENCH MC ! 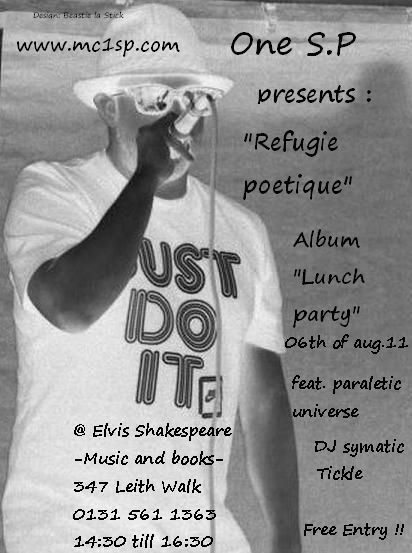 VENUE : ELVIS SHAKESPEARE (SEE FLYER FOR ADRESS) RECORD AND BOOK SHOP. From 14:30 till 15:30 , One S.P will perform his album and some freshly released songs -like “sittin in the park” – along with his Natox scottish counter actTickle (Black Lantern records) and DJ symatic and my good friend julien pearly (pundigrion films) who will sing our song “when it’s raining” and film the all event. Please fell free to buy records and books after the show, Elvis sheakspeare has a great selection of many genres of music and litterature !